To request a program and/or module change within a current term, a student should contact their Faculty Academic Counselling Office to complete a Change of Status form. Why should I complete an ITR? Your ITR preference is considered when decisions relating to your academic progression are being made (typically in May and June) for the subsequent Fall/Winter term. If you do not indicate your academic preference, you may be registered into an undeclared program of study. This may impact your eligibility to access courses during the Fall/Winter online course registration period. What should I do to prepare for ITR? Attend ITR information sessions offered by your Faculty Academic Counselling Office. Students will have access to online ITR in February - March through Student Center [Western Links - Complete My Intent to Register]. Changes can be submitted throughout the online ITR period. After submitting through ITR, a student will receive an email confirming the details of their request. In early April, ITR details can also be viewed in Student Center [Academics - Planning - View My Intent to Register]. Note: Some students will not have access to online ITR and will need to contact their Faculty Academic Counselling Office. Online Intent to Register (ITR) is no longer available for the 2019 Fall/Winter term (September 2019 – April 2020). Missed the deadline to submit your ITR online? Refer to chart below for next steps. Contact your Faculty Academic Counselling Office to complete an ITR. Year 2 Medical Science First Entry an ITR will be submitted for BA (Undeclared) Faculty of Science. Contact the Academic Counselling Office for Science & Basic Medical Sciences about submitting a Change of Status form by their deadline in June/July. It is very important that a student in a Common First Year program complete an ITR to progress into a program and/or module. Students who want to request a new program and/or module(s) Contact your Faculty Academic Counselling Office to complete an ITR. Students who want to request that they continue in current program and/or module(s) No further action is required. Your ITR will be generated based on your current program and/or module status. Activation Services are processes required in order to allow certain course registrations to occur. All Activation Services are accessible via Student Center. 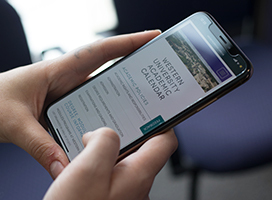 Current Western students wishing to enroll in courses for the upcoming Summer term are required to term activate themselves at least 72 hours prior to adding courses. This is done through the Summer Activation service on Student Center (right side under Western Links > Summer Term Activation). Note: All students newly admitted to Western for the Summer term and Visiting students will be automatically term activated. Summer Term Activation for 2019 will become available on February 1, 2019. Fall/Winter - All current undergraduate part-time students must declare their intention to enroll for the Fall/Winter 2019-2020 term prior to using the online course registration system (Student Center). Submit an Intent to Register from February 1 - March 31st, 2019. Summer - If you were active in the Fall/Winter term preceding the upcoming Summer term, you can activate for the Summer by following the Summer Activation procedure indicated above. For additional assistance, please contact the Student Central Helpline at 519-661-2100. The Office of the Registrar provides the most up to date course timetabling information for various terms, and also a personalized timetable service for current students. Further information on the available courses is available in the Academic Calendar. Please note: The Timetable is subject to change, please check for updates. Important Note: Please be aware that Western University does not support external timetable services. These providers may not have up-to-date and accurate information. When making your course selections, please ensure you meet all course prerequisites, antirequisites, and corequisites.